Forged in the hot sun and sand of the Arizona desert, Chinook Shannon is as tough as they come-as steely-eyed and tall in the saddle as Randolph Scott. But Chinook is far from home-in the north country of Montana-and facing a challenge as big as the territory itself. Following his grandfather’s suspicious death, he’s come to Montana to claim his inheritance-the family’s cattle ranch. But the territory’s crawling with bandits and bankers, and they all want a piece of Chinook’s land. With foreclosure hanging over the ranch, Chinook’s got exactly twenty-four hours to find out who killed his grandfather and become the Cattle King. He’ll follow a trail of forgery, cattle rustling and murder to find the truth, knowing he has only one ally-his Colt Peacemaker. 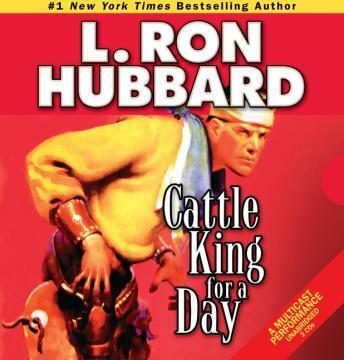 L. Ron Hubbard’s detailed knowledge of ranch life and mining techniques-as well as the economics and legal issues surrounding mining and water rights-informs Cattle King for a Day. He wrote: "I became thoroughly acclimated to Montana ranch life and the very rough and tough atmosphere. . . . It was also a mining area, and I used to pan in these streams for pocket money." It’s no wonder, then, that these stories are pure gold.